Photos credit Glenn Paulina/KGP Photography. Used with permission. If found please return to Jalopnik.com. We all pretty much know what the redesigned 2018 Jeep Wrangler is going to look like. But this week a prototype was spotted in camo that left very little to the imagination, and brought some interesting bits into focus. As you can see, this is pretty much the best look yet at the new Wrangler’s fender-mounted LED front turn signals, bumpers, Renegade-esque tail lights and revised fuel filler cap. But those aren’t the details I’m going nuts over right now. Look closely at the bottom corners of the windshield. You see hinges, right? Not only that, but there’s a clear split between the windshield frame and the Jeep’s body. Now check out that hood- above the bulge, which looks sweet, there are two nubs that seem perfectly positioned to support the Wrangler’s front glass were it to be dropped forward. Are you thinking what I’m thinking? Could the next-gen Jeep Wrangler “JL” have a folding windshield after all the speculation that it wouldn’t? And, dare we dream, could the windshield-lowering function actually be user-friendly this time? Longtime Jeep fans will know that OG military “jeeps” had a flat windshield that easily slapped-down for shipping, low-speed off-road navigation and smashing through the Starbucks Drive-Thru extra quick on the way to Omaha Beach. Early CJ civilian Jeeps had the same feature. Even the YJ of the ’80s, the first Jeep to be called Wrangler, had a flat-front windscreen that dropped quickly. The Wrangler following (and immediately preceding the current body style) known as the TJ had a slightly less-accessible, but still-foldable, windshield too. Today, a Jeep’s windshield can be folded down on a current JK-body Wrangler. But it’s an arduous process and it makes the 4x4 look like some kind of half-shucked oyster unless you completely remove the glass (it’s only four more bolts), because the current Wrangler’s windshield is curved for aerodynamics. If you want to know what it really takes to remove a modern Wrangler’s windshield, we documented the entire task for your amusement. After seeing what a royal pain it is to drop the glass on a new Jeep, we all pretty much figured that the next-gen Wrangler would strike the folding-windshield feature altogether. Especially after we heard titterings that Jeep parent company Fiat Chrysler Automobiles was planning on pursuing aerodynamics aggressively with this next Jeep redesign. And indeed, the upcoming JL Wrangler’s windshield appears to be raked at a gentler slant than the current JK’s. But it also seems flatter left-to-right. 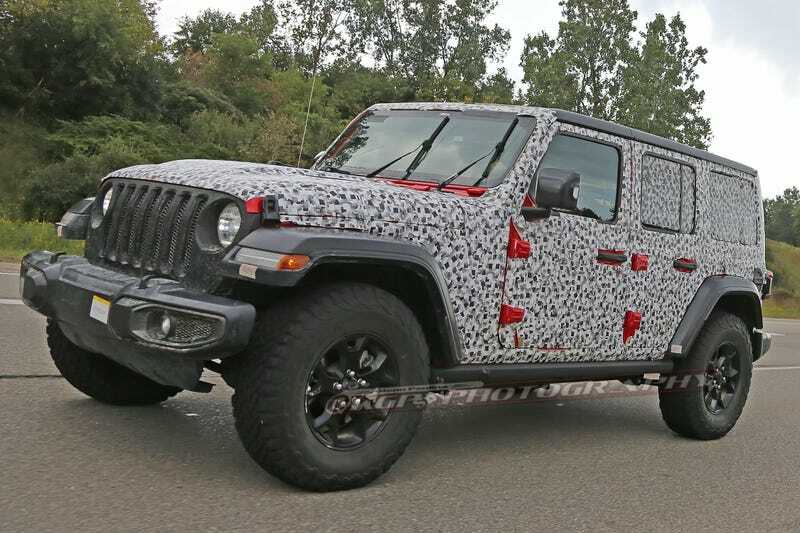 Which, like the exposed hinges up front, suggest that the next Wrangler is not only going to retain the model’s famous folding-windshield ability, it’s going to be more accessible to the casual user. Now before you scroll down to leave a reply and tell me “driving around with no windshield is dumb,” oh hell, you’ve done it already haven’t you? Listen- driving around with no windshield is one of the greatest joys of life on this Earth. And if you haven’t tried it, go ahead and kick the glass out of your car before you head home from work and tell me that wasn’t the best idea ever by the time you get home. Well, maybe you wouldn’t want to drive windshield-free all the time, but that’s the beauty of the hinge. From 0 to about 45 mph, which is pretty much the extent of a Wrangler’s comfort zone anyway, the wind and bugs and weather really are a lot of fun to soak up directly through your face. All joking aside, I think an easily removable windshield would be a great value-add for the new Wrangler and if it ends up being real, I’d highly encourage new owners to utilize it. Just don’t forget the Mad Max goggles and scarf.